An urgent order has gone out from the Election Commission for supply of 26,820 ballot units, 2,240 control units and 2,600 VVPATs of third-generation (M3) EVMs make, to the Chief Electoral Officer, Telangana. The emergency is on account of Nizamabad, from where Chief Minister K Chandrashekar Rao’s daughter and sitting MP K Kavitha is recontesting. The old M2 EVMs can accommodate only 64 names; the constituency has 185, nearly three times that — making it the seat with the largest number of candidates this general election (there are 258 candidates in the remaining 16 Lok Sabha seats in the state). The new M3 EVMs can be connected to 24 ballot units and accommodate up to 384 candidates. On Monday, the EC dispatched a team of three officers, headed by Deputy Election Commissioner Umesh Sinha, to Nizamabad to oversee the poll preparations. Standing against Kavitha are former Congress MP Madhu Yaskhi Goud, the BJP’s Dharmapuri Arvind, and 179 farmers as Independents, apart from one BSP nominee and two other Independents. While this briefly triggered calls to revert to ballot paper — Telangana saw them last in a 1999 election — the EC has decided to have M3 EVMs instead. The record for the highest number of candidates ever is also held by a constituency that now falls in Telangana, Nalgonda, from where 480 stood in 1996, necessitating 50-page ballot papers. The same year, in Assembly elections in Tamil Nadu, 1,016 farmers had contested from Modakuruchi seat. A scrutiny of the affidavits of the farmer candidates in Nizamabad shows they own 2-5 acres of land, have bank balances of less than Rs 3-4 lakh, plus Rs 5-6 lakh of other assets. In 2014, when there were nine candidates in the fray in Nizamabad, Kavitha had won with 42.49 per cent of the votes. Goud, again fighting on a Congress ticket, had got 26.32 per cent of the votes and the BJP’s E Lakshminarayana 21.79 per cent. Denying they were being sponsored, the farmers talked of their genuine and long-lasting concerns. For several months now, many have been protesting outside the Nizamabad District Collector’s office, demanding minimum support price for turmeric (at least Rs 12,000 per quintal, against Rs 4,500 now) and jowar and establishment of a turmeric board. With their demands unmet, they resolved a month ago to elect one of their own. 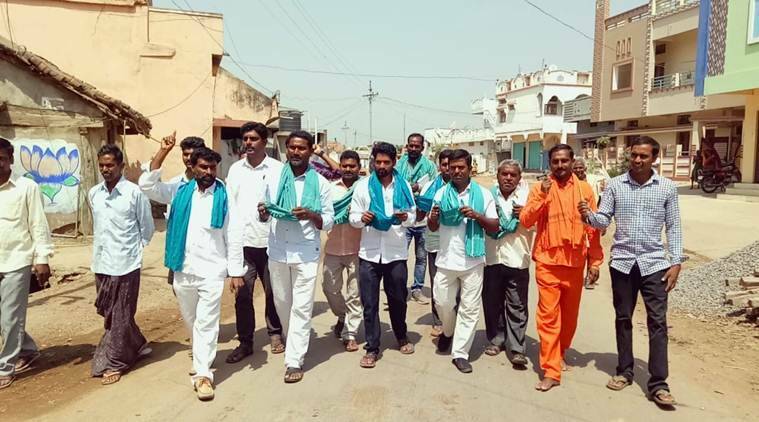 On Monday, a farmer sangam of five mandals of Nizamabad district decided to choose one name on April 8 or 9, to ensure their votes are not split. With 80 per cent of the turmeric farmers Reddys, the candidates are overwhelmingly from this community. Candidate Lingareddy Santha said this was because most Reddys are landlords, well-off and better organised. A Laxmareddy of Armoor, a turmeric and jowar farmer who owns 5 acres and is a candidate, said more than 200 farmers would have been in the fray had it not been for “intimidation” and “armtwisting” by TRS leaders. At least 245 farmers had filed nominations but 56 withdrew while 10 nominations were rejected. S Anvesh Reddy, who is chairman of the Telangana Kisan Congress and is leading the protests, claimed “more than 500 farmers were supposed to file their nominations”. Calling for a turmeric board, he added that Kavitha had moved a private member’s Bill in 2017 on this, but it was never passed.